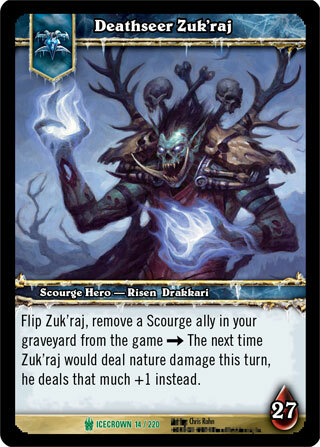 Rules: Flip Zuk'Raj, remove a Scourge ally in your graveyard from the game -> The next time Zuk'Raj would deal nature damage this turn, he deals that much +1 instead. ;;Deckbuilding: You can only include [Druid] abilities, [Shaman] equipment, allies with ally type Death Knight, neutral quests and locations, and Scourge cards. You can't include cards with reputations or other text restrictions (like Balance Hero Required).